A dear reader suggested I write a book on NOT recipes and I think it is a seriously good idea. Raw Pea Pie will definitely go into that book. First of all because it is actually rappie pie and second of all because it is one of those recipes that everyone in the know thinks they have the authentic recipe for. 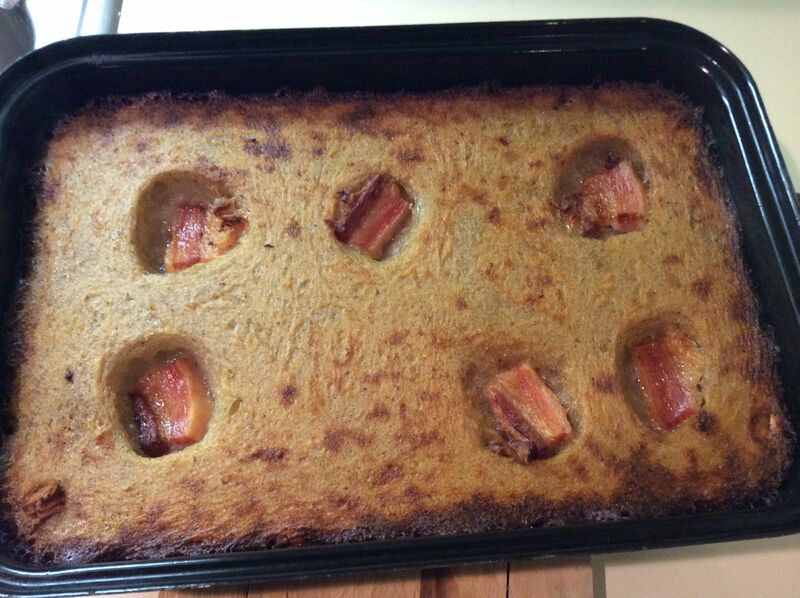 For a description of rappie pie, see last post. 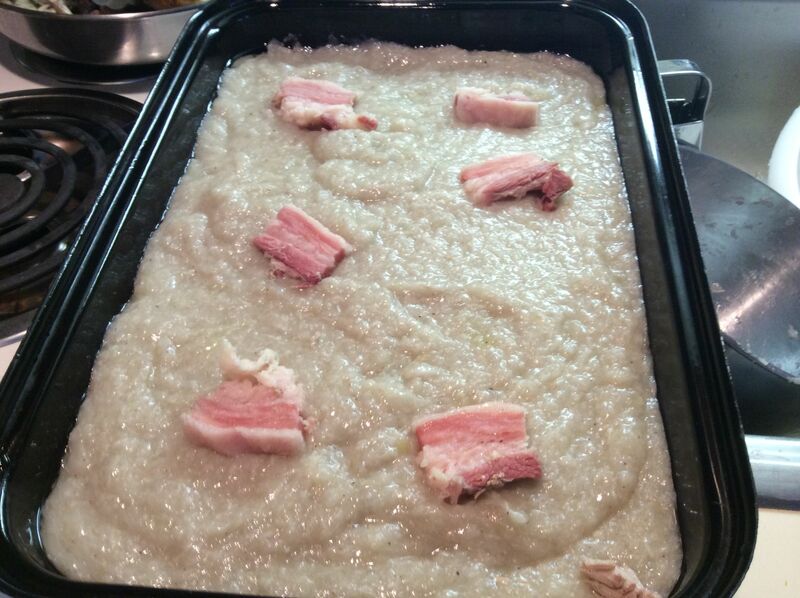 Rappie pie elicits glassy-eyed rapture in Acadians and mostly skepticism in non-Acadians. It is a comfort food, plain and simple. Comfort foods don’t have to make sense and they usually aren’t too appealing to those who didn’t grow up with them. This rappie pie recipe is Abrams River-style as shared by a local with his Italian wife who taught it to their chef son who demonstrated the making of it to his blogger wife. Full disclosure: I don’t like rappie pie. Not only that but it is one helluva lot of work to prepare. In Abrams River during Fahbio’s childhood, it was the work of 6 people (3 couples). Astute readers will remember that I previously put the population of Abrams River at 7 but what I am talking about is summertime rappie pie-making when the population swelled with Fahbio’s family visiting from Montreal. Three men would grate the potatoes. Two ladies would prepare the “pie”. The third woman would take care of the kids, play music and make the lunches. 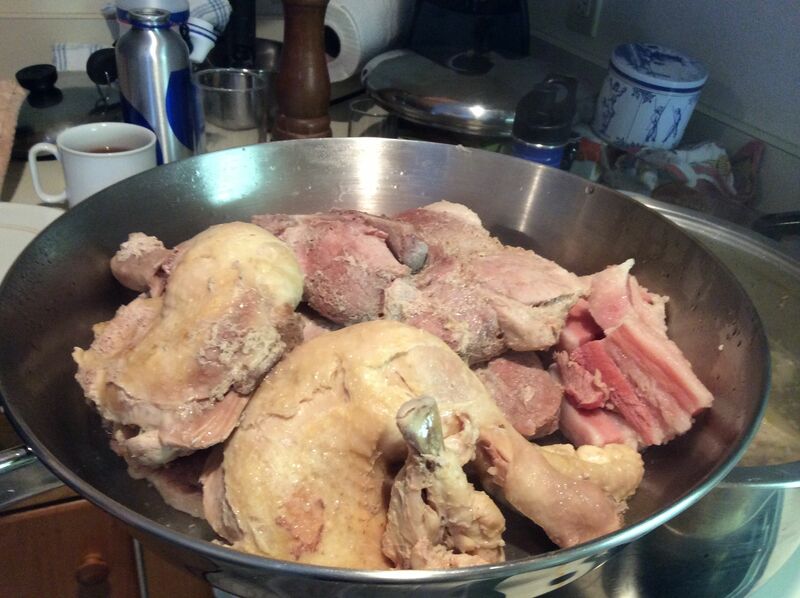 Make a big pot of strong chicken, salt pork and normal pork broth. Some of you will be out already. 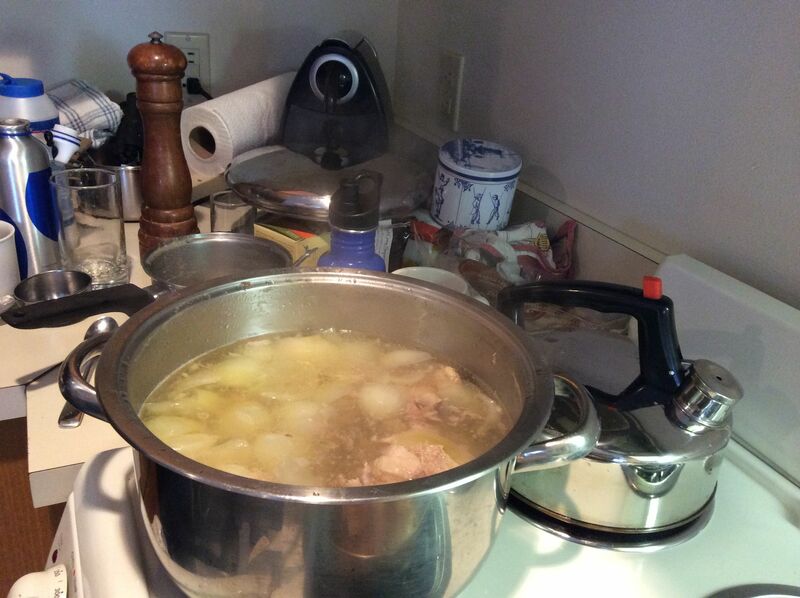 Homemade stock – who has time for that? Peel 10 pounds of potatoes. A few more of you will be out. 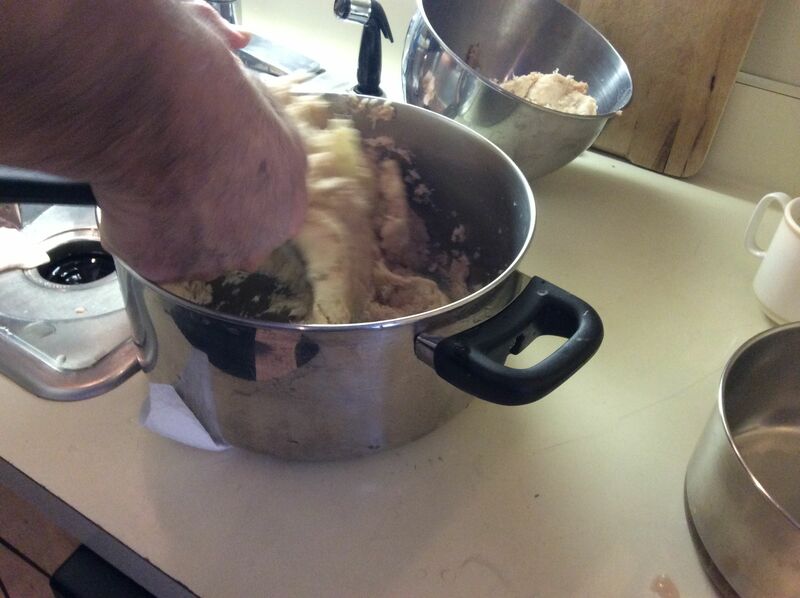 Take note that the AcadianSix would peel 50 pounds of potatoes when they made rappie pie. 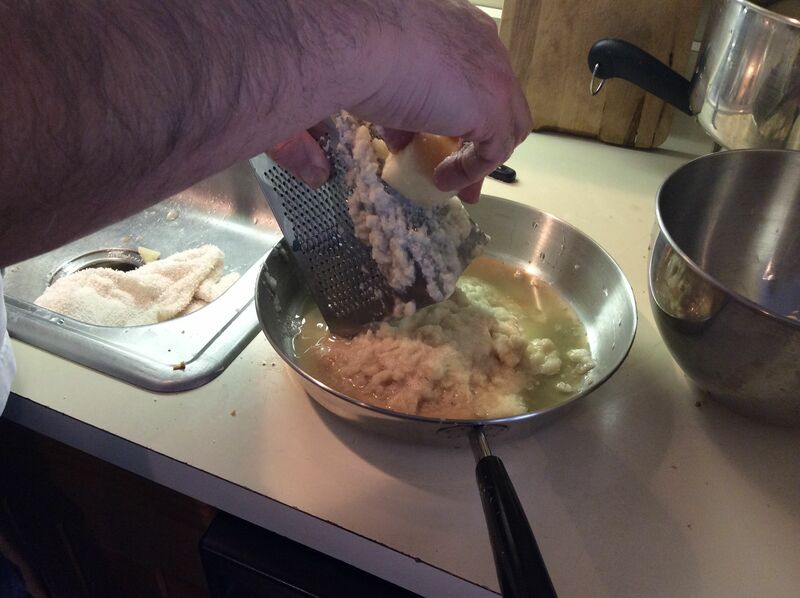 If you are Acadian, grate the potatoes on your special homemade grater. If you aren’t, use the side of your box grater that you have never used before. The one that looks like someone pierced the metal from the inside with a nail. It will take one person a good hour to grate 10 pounds of potatoes on this thing. I suspect that a few more of you are bowing out. 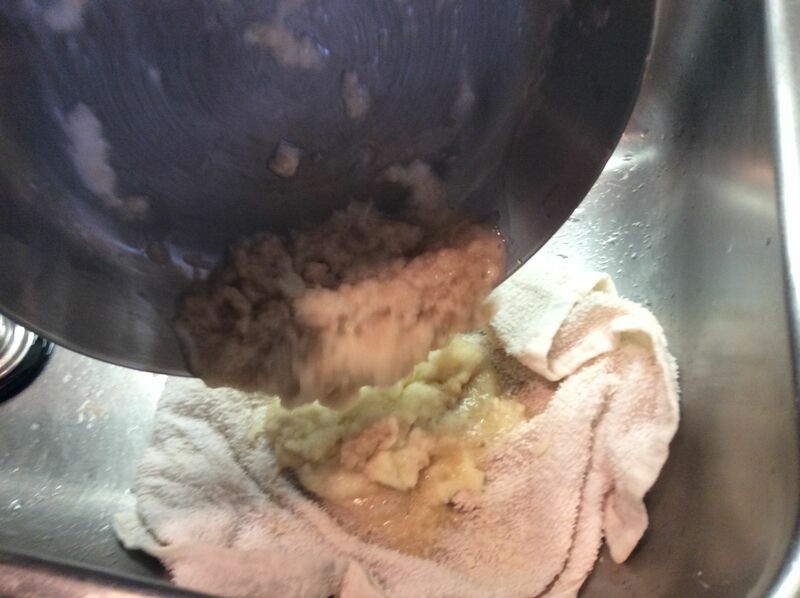 Fahbio discards the potato knobs that get too small to grate but he says that the AcadianSix would always grate the knobs right down to nothing so grated knuckles and blood would seem to be part of the authentic recipe. Squeeze the grated potatoes in batches in a tea towel or cheese cloth. Work as you grate so the potatoes don’t discolour. 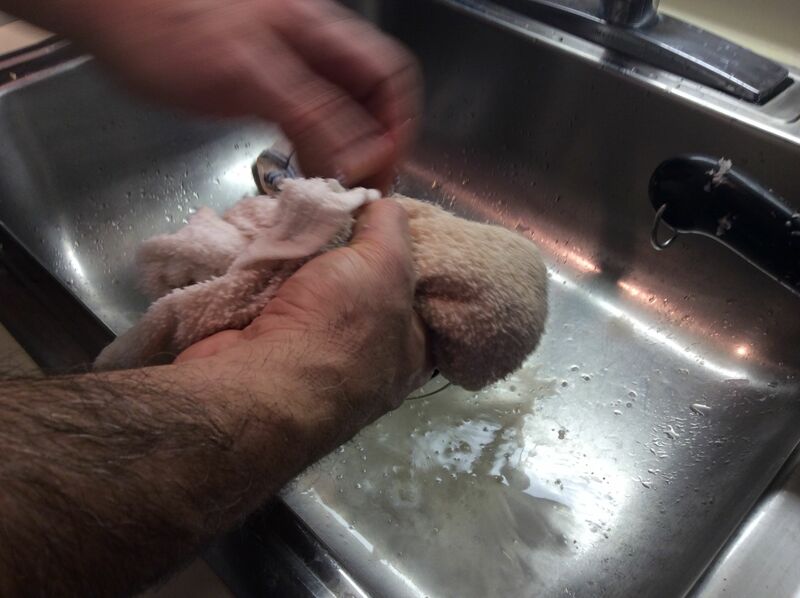 Fahbio discarded the starchy water (kids were in ski school) but if you have kids, let them play with the starch. It will keep them occupied for the next 3 hours while you continue with the rappie pie. Put the dried grated potatoes in a large bowl. They will look a bit like shredded coconut. The next part is like making risotto. Add a small ladleful of broth to the potatoes and stir vigorously. When it is all absorbed, add a little more. 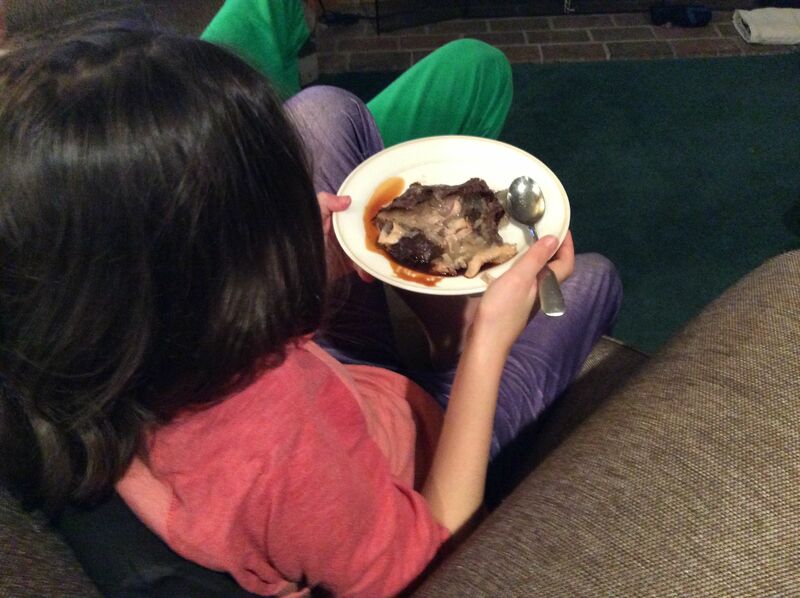 Keep going until you have a gloopy, gelatinous mess. You cannot add all the stock at once (or even too quickly) or the mixture will “break”. Any survivors still standing? 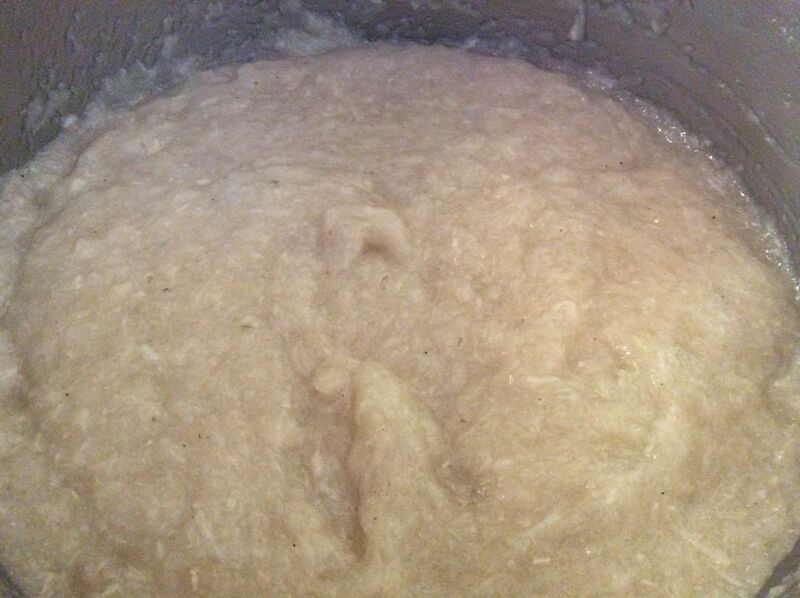 You want your potato mixture to become gloopy like this one. You don’t want it to turn out like this. 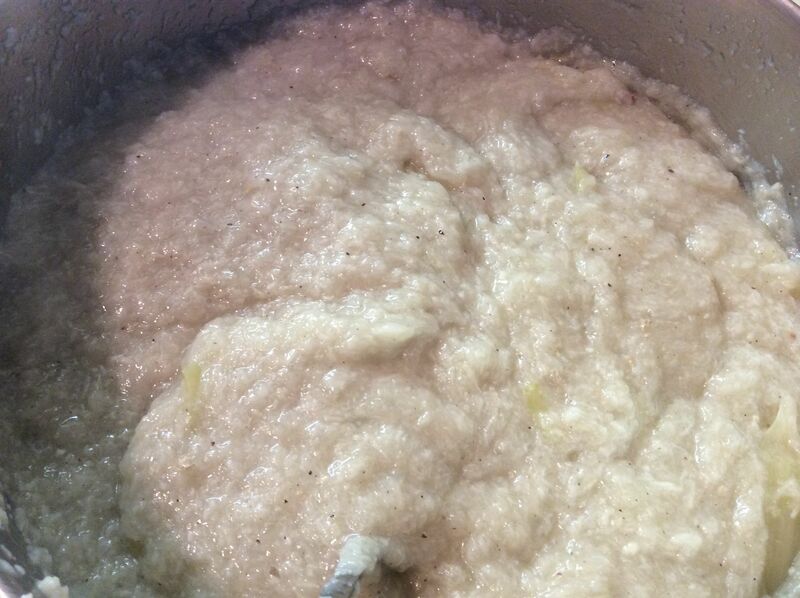 Fahbio insists that he added the stock in too quickly to this, Batch #2. What? You think the two pictures above look just the same? Don’t despair it takes time to become a rappie pie connoisseur. 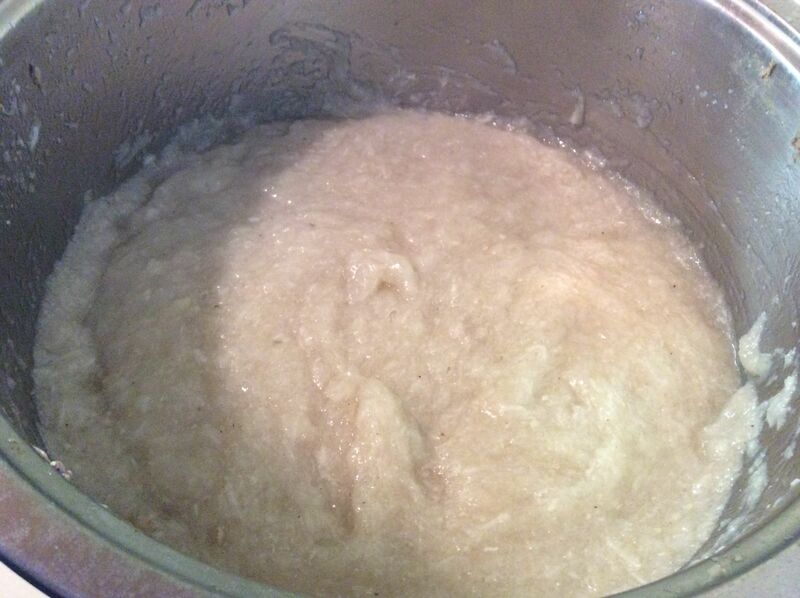 Here is another picture of Batch #1 (the good batch) to help you. Oil a massive roasting pan (fat from your stock is good for this). We didn’t have a roasting pan at Sugarloaf so Fahbio made two smaller rappie pies. Advantage: He could make one with lots of pepper and onion (his style) and one with less (kids’ style). Cooked onions from the stock. Disadvantage: Not at all authentic to make small rappie pies. Put 1/2 of the gloop into the pan. 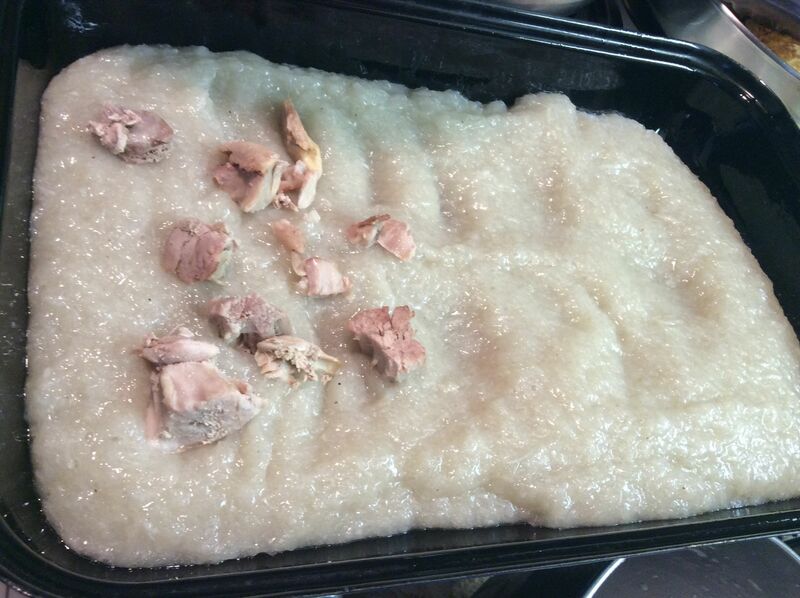 Add a layer of cooked chicken/normal pork you have removed from your stock and cleaned. 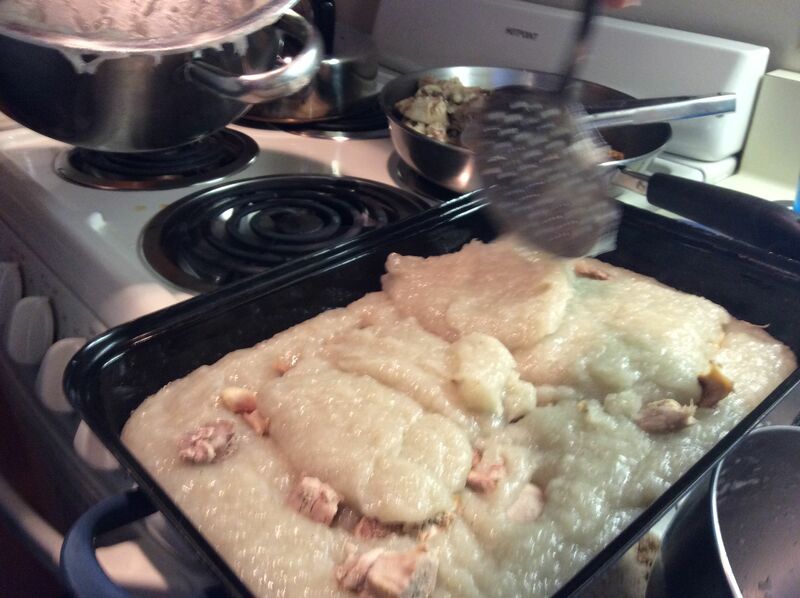 Plop the rest of the gloop on top and spread out. Dot with pieces of salt pork. Dotted and ready for the oven. Bake at 375-400 degrees for 2-3 hours (depends on how massive your pie is). You’ll know it’s ready when it smells done and it is crusty. 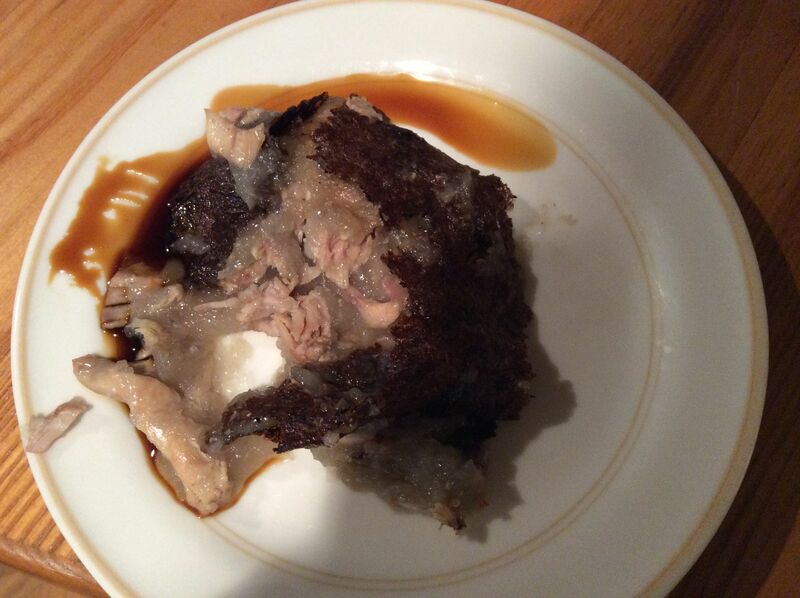 Depending on where you’re from, serve with brown sugar, white sugar, pork drippings, butter. Since this recipe is Abrams River style, eat with butter and molasses. Enjoy. Or not. As the case my be. Venice’s plate complete with molasses.